Members of the LCH Blue Team left to right: Monserrat Balbuena, Medical Assistant, Dr. Federico Ceppa, M.D., Director of Primary Care, Clark Davis, Caseworker and Workforce Development Program Coordinator, Johana Guzman, Registered Nurse. KENNETT — La Comunidad Hispana (LCH) has a rich history of serving the southern Chester County community. Now, it has more resources than ever to be able to take care of its residents. 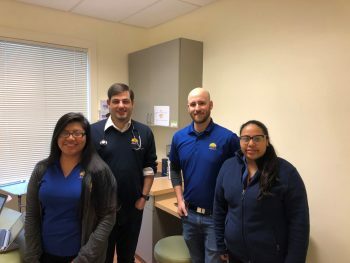 LCH recently transitioned to Team-Based Care, a model in which a provider (physician or nurse practitioner) is paired with a team including a registered nurse, medical assistants, a member relations specialist (MRS), a social services caseworker, and a behavioral health consultant (BHC). Together, each team shares a panel of patients, coordinating care and following up with the patient’s goals and needs. LCH has four Primary Care teams, as well as a Women’s Health team and a Dental Center team.